The Yew Lake on the Decoy complex saw most of the JVAC lads struggling with the wet and windy conditions. But not matchwinner Nick Carlton. He drew peg 20 and was able to fish a long pole line, feeding caster and catching on a pellet hookbait. Tuesday Club winner Mel Saggers. When that line stopped working he came into the margins to net carp and barbel to finish well clear on a level 89lb. 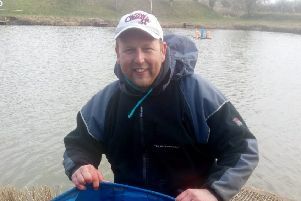 Runner-up with 65lb 3oz was Roy Whincup, who caught on a small feeder from peg 22, then came Andy Gausden with 58lb 7oz. This match also incorporated the final of the Winter Knockout event between Kevin Wilmot and John Savage and it was Wilmot who comfortably took the honours with 42lb 14oz. Savage had 15lb 4oz. Over on the Beastie Lake the open match anglers made light work of poor conditions. In fact matchwinner Billy Marlow caught on a shallow rig with pellet for most of the match on peg 13 putting a massive 182lb 6oz to the scales. 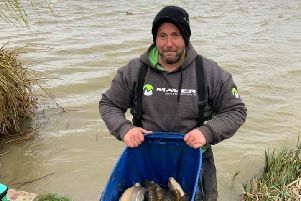 Runner-up from peg 30 was Rob Goodson, who caught on a short pole line after getting no bites at all on the feeder before bagging up in the margins with maggot to finish with 157lb 14oz. Third from peg 23 was Chris Barley. He fished the feeder, then switched to a pole and pellet for 123lb 14oz. Another windy day on Beastie Lake on the Decoy complex last Friday saw the final round of the Over 55s winter series take place. The lake fished well for those competing though in spite of conditions. Roy Whincup took the honours with 106lb 9oz from fancied peg 30 using a short pole line on sweetcorn. For the first time this year the cat meat worked for Chris Saunders. He caught F1s, barbel and skimmers in the margins to take second place with 104lb 13oz from peg 20. Third was the ever-consistent Gordon Parker with 97lb 13oz from peg three. Parker took the league title with 53 points with Whincup second on 33 and Tom Wilson third on 30. The 2019 Hotpoint club matches got under way at Decoy on Sunday in conditions more akin to winter than spring as high winds, rain, sleet and hailstones made sure it was a very unpleasant day for all those taking part. I managed to pull out peg seven on the Horseshoe Lake, one of the better pegs, but struggled until the last couple of hours. But then I had a great time picking off carp in the margins on dead reds to finish with 51lb 12oz, which included one big double-figure fish on the whistle. That gave me the edge over runner-up Kevin Schneider on peg 18, the hot peg at the moment. He finished on 49lb 10oz with Pete Howson third on peg 16 with a level 35lb. The last Tuesday Club match of the season on natural venues saw them fishing a wet and windy Forty Foot Drain. Thankfully the fish were feeding and Mel Saggers won with a net of small fish weighing a respectable 14lb. Second was Paul Dotchin with 12lb 8oz, followed by Mike Smith on 12lb 6oz.